“Copper is going to be everywhere,” forecasts event coordinator Carisa Smith of Adornment Events in downtown Milwaukie. Incorporating the trending metal with deep pink and blackberry creates a tableau that Smith dubs a “Moroccan romance.” Throw in some rich velvets, artisan food and drink and handmade accessories, and it’s a recipe for an enchanted evening. Foxtail Bakeshop’s owner and baker, Nickol Hayden-Cady set up shop in Bend and has quickly become a favorite for her wedding cakes that are as tasty as they are gorgeous. 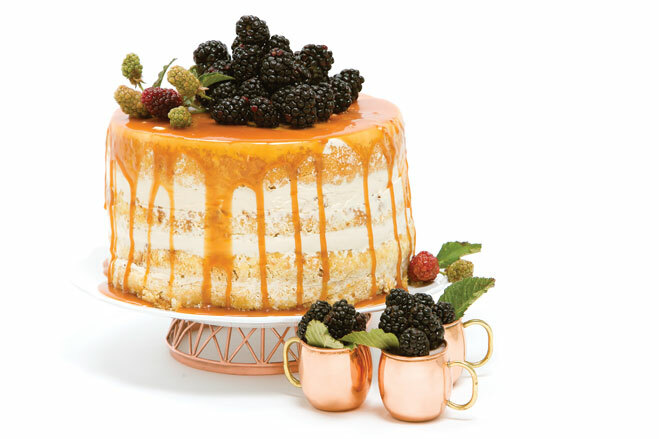 Her cardamom almond chiffon cake features layers of brown sugar buttercream and is finished with a to-die-for bourbon caramel. $5 per serving. Metal stand from Anthropologie. Hayden-Cady serves up bay-leaf-infused panna cotta topped with fresh blackberries in mini Moscow mule mugs. $3.75 per serving. 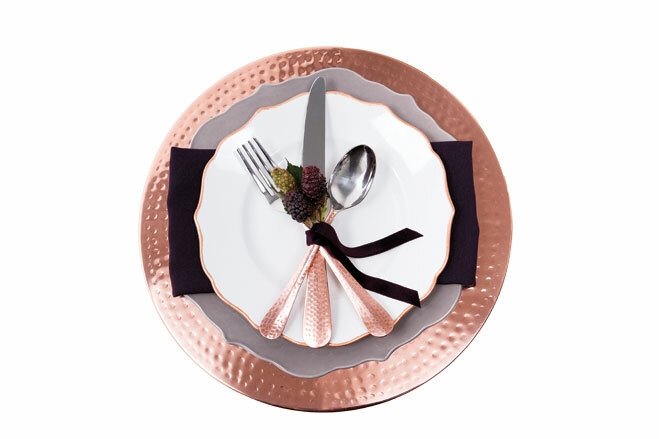 Smith hand-painted the rims of white Target plates with copper ceramic paint for an eclectic place setting that combines high-glam metals with organic shapes and an unexpected sprig of fresh Oregon berries. Copper charger and napkin from Barclay Events. Dinner and salad plates from Target, $4.99. Copper-handled Seraphina flatware from Pier 1 Imports, $4.95 each piece. Mandalena’s Agadir necklace is a one-of-a-kind creation from Portland designer Mandalena Jones. Vintage crystals and rose gold and copper chain form the base from which an opalite vintage Swarovski crystal hangs. Her “Safi” earrings dangle with rose gold and brass chains and Swarovski crystal. Necklace, $699, earrings, $149, both from Mandalena. 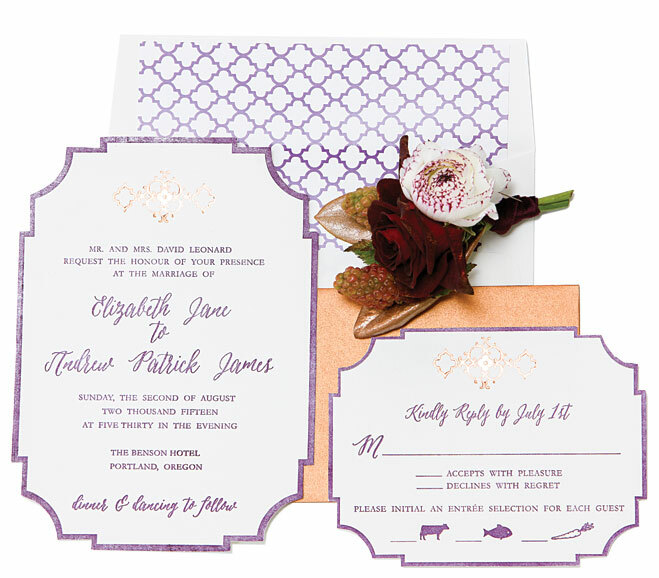 A letterpressed invitation suite by the Card Bar in Lake Oswego sets the exotic elegant tone with foil-stamped copper text and Moroccan-style graphics. $2,375 for 100, minimum order 75. Boutonniere from Bloomsberry Floral, $15. Portland distillery Wild Roots infuses their vodka with Oregon-grown marionberries for a sweet, fragrant base to its drink Portland Blush. An easy combination of vodka and prosecco, it’s a delightful late-summer signature cocktail. Bottle, $32.95. 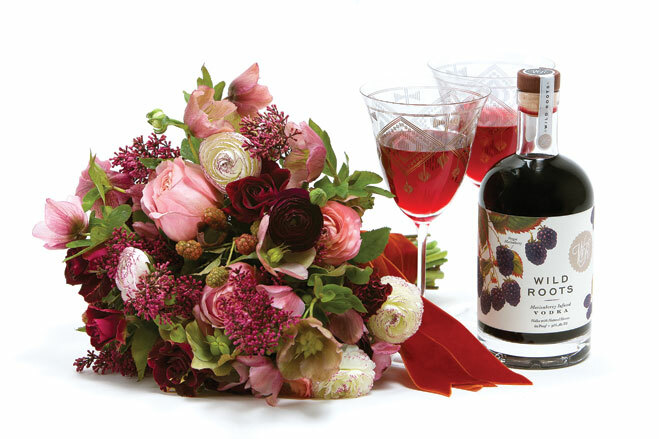 Bouquet of ruffled ranunculus and red-wine roses by Bloomsberry Floral, from $175. Glasses from Anthropologie.